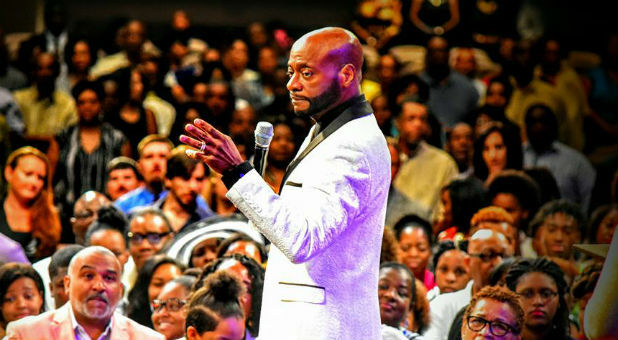 New Birth Missionary Baptist Church pastor Bishop Eddie Long died January 15, 2017, after a battle with an aggressive form of cancer. He was 63. In an official statement from the church, acquired by WGCL in Atlanta, First Lady Elder Vanessa Long, Bishop Long's wife, said, "I am confident through my belief in God that my husband is now resting in a better place. Although his transition leaves a void for those of us who loved him dearly, we can celebrate and be happy for him, knowing he's at peace." Long reportedly struggled with health issues for much of 2016. In August, a video clip appeared with a slimmed-down Long who told the camera he was on "God's medication." "No medications. I'm on the medication that God gave to feed your immune system, to build you up, because you know what? If you really want to move through this world and have influence, you gotta be spiritual, you gotta walk by His commandments and you know you have to be healthy. You know the Bible says, 'Behold I want you to be in health,' and the prosperity and all of that, and so I want to be in good health because I know God's given me something for me, for the church, for the kingdom and He's given you something," Long said. But later that year, Long was hospitalized for a mystery illness, which some claimed was cancer. "I am recovering from a health challenge that I trust God to deliver me from. It is unrelated to the eating for life diet consisting of mostly raw vegetables that I am continuing, as part of a holistic approach to good health," Long said in a statement at the time. Long was born in Georgia in 1953 and stepped into the pastoral role at New Birth in 1987. According to his biography, membership flourished to 25,000 under the bishop. The pastor was involved in a handful of scandals that ranged from a Ponzi scheme to sexual allegations. Long took a leave of absence from New Birth in 2011 before returning in the new year in 2012.